I appreciate receiving inquiries from readers asking for the whereabouts of the second book in the Musique Fantastique series, and I apologize for the delay of getting it completed, but I am pleased to report that there is a visible light showing at the end of the tunnel. Here’s what’s up. I am completing on another contracted book which I have to do first – it’s called Music for Super Hero Films for McFarland & Co, after which then I’ll dive into MF Book 2 for Midnight Marquee Press and the following books in the series after that. The problem is that I’ve been insanely busy with a constant stream of album notes & other writing projects in various areas that are by necessity taking priority on my schedule and so it’s been difficult to find time to finalize the Super Hero book. With about 2-dozen interviews still to transcribe and then finalize text into the chapters, fact-check everything, make it all fit into the agreed-upon book length… it’s a daunting process that both keeps me off the streets and keeps me happily tied to the keyboard most nights (I keep late night hours). I am committed to getting it done on or around the year’s end, then wrapping MF V2#2 very quickly next year, since it only requires updating, editing, and reconfiguration of the chapters to fit the assigned length. After that there’s an updated bibliography on Robert Bloch, a book of Lovecraftian haiku, and several other book projects currently being seasoned in the cannibal cauldron waiting for their turn in the serving dish. I’ll try to keep interested parties and tax collectors better informed of my progress! Pictured below: the original mock-ups of the four-volume series planned for publication by Creature Features, whose interest prompted the new edition in the first place. Only Book One was published. The remaining books are being revised and reorganized and are planned to be published by Midnight Marquee Press beginning around mid-2019. The great Bill Nelson designed and painted the covers for Creature Features – thanks to Taylor White for permission to post them here. (click here for larger image). 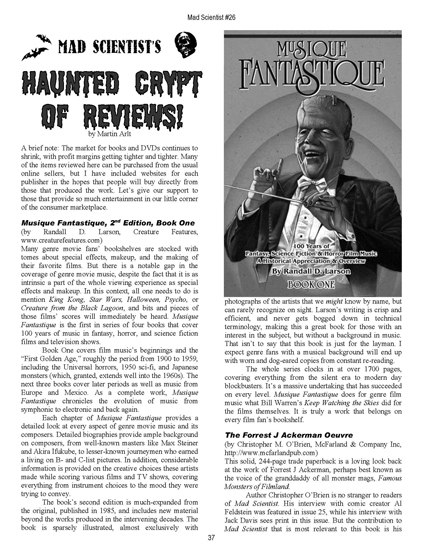 (Eureka, CA) June 13, 2015: Musique Fantastique announces that Midnight Marquee Press, a specialty publisher noted for its quality paperbound and hardbound books focusing primarily on classic horror and science fiction films, has contracted with writer Randall D. Larson to publish the continuation of his Musique Fantastique, 2nd Edition, book series, beginning with Book 2. The book series is a wholly re-written and expanded update of Larson’s 1985 book, Musique Fantastique: A Survey of Film Music in the Fantastic Cinema. Because of the comprehensive, in-depth coverage Larson has taken in his historical analysis of music in these films, the new edition has been divided into several books, each covering distinctive aspects of the film genre’s music. “Having another opportunity to work with Randall and continue his loving and detailed tribute to film music, both classic and current, was an opportunity that we jumped at,” Midnight Marquee Press president Gary J. Svehla added. Midnight Marquee Press will publish the second book in the series, which will focus on genre music in the 1960s, Bernard Herrmann’s substantial contributions to these genres, and music in animated fantasy & science fiction, in Spring/Summer 2016. Additional books in the series will follow. I am so very pleased that Musique Fantastique II Book 1 was nominated for a Rondo Hatton Classic Horror Award for best book of 2012! Since 2002 the Rondos have been fandom’s only classic horror award. They are decided by fans, for fans. Click the link above for more info on the Rondos – and my congratulations to all the winners! Thanks to Jeff Berkwitz at SCI FI magazine for this cool story in their April issue (above). “Detailed biographies provide ample background on composers from well-known masters… to lesser-known journeymen who earned a living on B- and C-list pictures. In addition, considerable information is provided on the creative choices these artists made while scoring various films and TV shows, covering everything from instrument choices to the mood they were trying to convey. The e-book edition of Musique Fantastique II Book One is now available for kindle and nook. Click here for the amazon link, and here for the nook link at Barnes & Noble. Thanks to Jon Burlingame for his good words about MF2 in his roundup of film music books at the Film Music Society web site! Special thanks to writer Dejan Ognjanovic for a terrific full-page write up on Musique Fantastique in the December issue of Rue Morgue magazine [left]! And to the editors for including it in the bottom banner on the issue’s cover! Creature Features announces the publication of a wholly rewritten, revised, and expanded 2nd Edition of Musique Fantastique: 100 Years of Fantasy, Science Fiction & Horror Film Music by noted film music writer, Randall D. Larson. The first (of four) separate books that make up the book series will be released in September as a limited edition trade paperback and an e-book, with the succeeding three books to appear shortly. When it was published in 1985 by Scarecrow Press, Randall D. Larson’s Musique Fantastique: A Survey of Film Music in the Fantastic Cinema was the first book-length analytical commentary of these genres of film music. 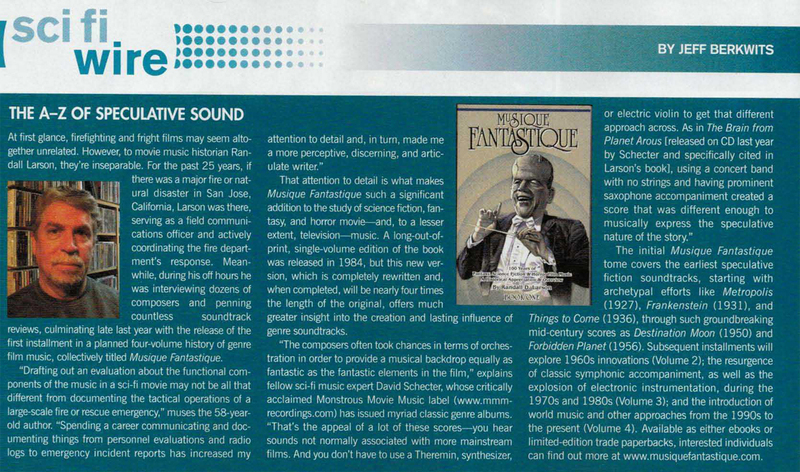 Out of print, elusive, and sought after for many years, Musique Fantastique has been regarded as a unique and important reference work for students and enthusiasts of both film music and fantastic films. The first extensive analysis of music in science fiction, fantasy, and horror films, Larson’s exhaustive commentary covered the use and techniques of music in these genre films from the silent era and the groundbreaking Golden Age of the ’30s and ’40s through the rise of electronics and the resurgence of symphonic film music in the late ‘70s and early ’80s. Taking the approach that film music has an especially unique responsibility in these genre films and has achieved significant advances in musical style and form in these genres, Larson examined in detail how music has been used to intensify the filmgoing experience in these types of movies. “Creature Features is pleased to announce the publication of Musique Fantastique, 2nd Edition, said publisher Taylor White. “Intricately detailed and wide-ranging in its scope, Randall has significantly expanded his in-depth coverage of the subject, from the silent era through the summer blockbusters of 2012.” Featuring a new introduction by film composer Christopher Young, Musique Fantastique, 2nd Edition, is a massive, four-book comprehensive examination of music for fantasy, sci-fi, and horror films and television worldwide. – from the Introduction by Christopher Young. Randall D. Larson was the editor and publisher of CinemaScore: The Film Music Journal from 1981 to 1987, and for many years thereafter senior editor and reviewer for Soundtrack Magazine, until its demise in 2002, “The Score” columnist for Cinefantastique magazine, and a prolific writer in fields of music, fantasy literature, cinema, and other fields of interest. The original Musique Fantastique was his first book, published in 1985, and was followed by Music from the House of Hammer, Film Music Around the World, several books about author Robert Bloch, and Films Into Books, the first book-length study of film novelizations and movie tie-in books. Larson currently writes the Soundtrax film music column for buysoundtrax.com and is the author of more than 100 liner note commentaries for specialty soundtrack albums. He currently resides in Eureka, California. Musique Fantastique 2nd Edition, Book One, sells for $29.95 (trade paperback – limited edition of 500 copies) or $ 14.97 (e-book – forthcoming).